As you know and of course, any comments, favs and suggestions is so appreciated by me. By the way, it does look better downloaded!! Sadly, details are blurred or lost in the above photo. Its so tropical and so cool! It looks like a storm just hit which fits the scans expression. I love the mist and the river and the trees are so perfect. Very pretty wall indeed and i love the bg and scan very much. Ummmmm i'm glad u use this sacn cause i rarely see this kinda scan in MT> Hey keep it up !! The scan is really cute! soo cute Emma!! you really made a great wallie!! background is amazing and the girl is soo cute!! woow you did this brushes?? that is soo good!! gonna add it on my favs!! keep it up the good job, Emma!! This wallpaper is so cool and beautiful !! I love it so much !! 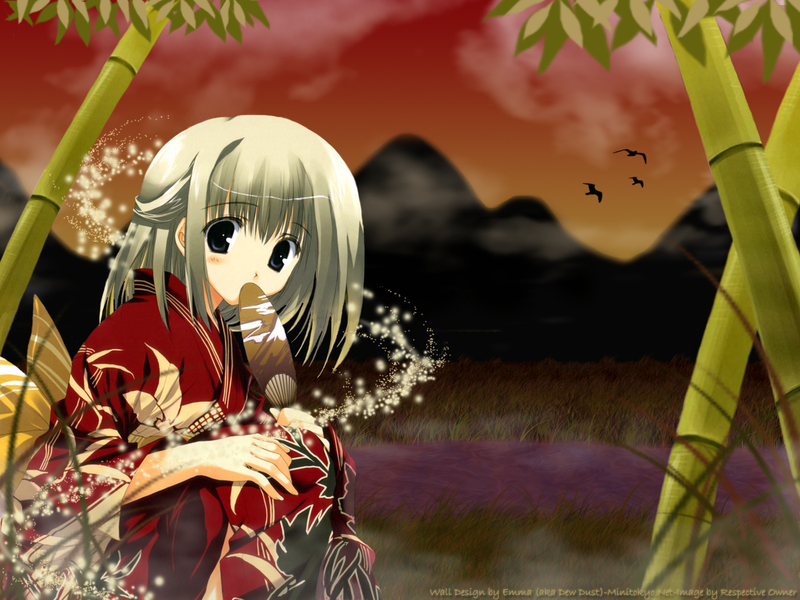 The girl is cute and with the awesome background , it look more great !! Thank for sharing !!! great job^_^i love the image it's really kawaii and i think it fits the bg. Very nice wallpaper, I like the scan and the background ^^ great job :D.
^-^**...and the bg is nice too!!! I dunno why, but I wasn't notified of this wall... Grrrrrr! Very cool, I love how you managed the bamboo! did you vector them or something - I ask, because kami-sama knows I've tried at making bamboo before. Damn it, I've reached my fave limit! Very nice wall paper Emma. I hope to become as good as you at this. I am new to the wall paper thing. I downloaded Adobe Acrobat or something like that last night. Took me almost 7 hours! I do not have a high speed connection so it's frustrating. But I am at a loss as to how to use it and I only have a 30 day trial. I am thinking I will buy photo shop soon. See you can do it a great walls!! aw such a cute scan you used. nice background. Great job as always. everything fits well! Wonderful wallie Emma :) I really like it a lot especially the background it's well done! if you ask me it deserves to be added to my favorites but unfortunetly I can't add it :( so you have to wait! such a strong color...very vivid and a live...nice job emma, always a pleasure to see your work..